The application VeryPDF PDF to Image Converter has the ability to convert PDF document to create multiple kinds of image formats like JPG, JPEG, BMP, GIF, TIF, TIFF, PNG, TGA, etc. In addition, you can also use this excellent application to make batch conversion, convert the user or owner password protected PDF document, set image resolution, color depth, specify converted page range, compress image, etc. 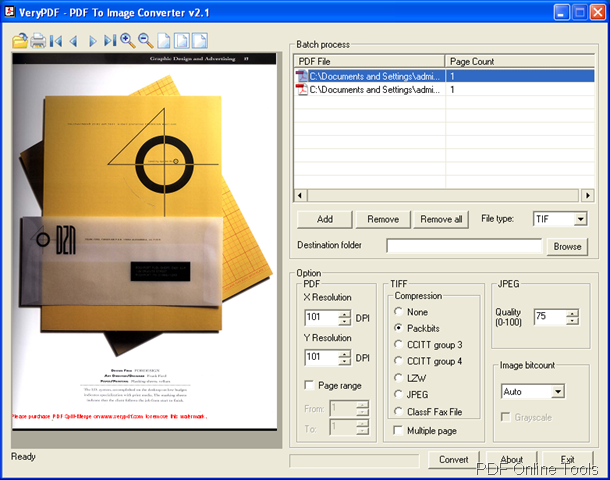 In this article, you will see the main usage of PDF to Image Converter. But at first, you need to download the program via clicking here. Please double click the installer and follow the installation wizard to fulfill the installation process. When you double click the application icon or open the program in Start menu, you will be able to see its clear and friendly user interface like the one shown in Figure 1. Click the button above the preview window to open file picker window and choose the file(s) you need. Click Add button to open file picker window and choose the file (s) you need. Directly drag PDF document (s) and drop it/them into the file list. You can delete the selected file (s) or all files from the file list by clicking the button Remove or Remove All. Please choose the output image format in File type dropdown list and specify the output location in Destination folder edit box. Then you will be able to set parameters for output image file. 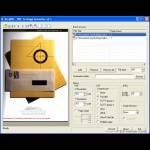 In PDF group box, you can set image X or Y resolution. You can also choose the converted page range by input the start and end page number in From and To spin box. If you have chosen output format as TIFF, you can use different compression methods to compress the output image in TIFF group box. Also, you can create multiple page TIFF image by checking Multiple page box. If the output format is specified as JPEG, you can set its image quality in JPEG group box. In Image bitcount group box, you can set the color depth for output image as 1, 4, 8 or 24-bit. You can also create a grayscale image by checking Grayscale box. If you have set done all the parameters, please click Convert button and you will see the progress bar at bottom of the interface. To implement the same functions of PDF to Image Converter on servers, you can take PDF to Image Converter COM as your tool. Moreover, if you want to convert PDF to TIFF, maybe you can have a try of the special application—PDF to TIFF Extractor or PDF to TIFF Extractor COM. 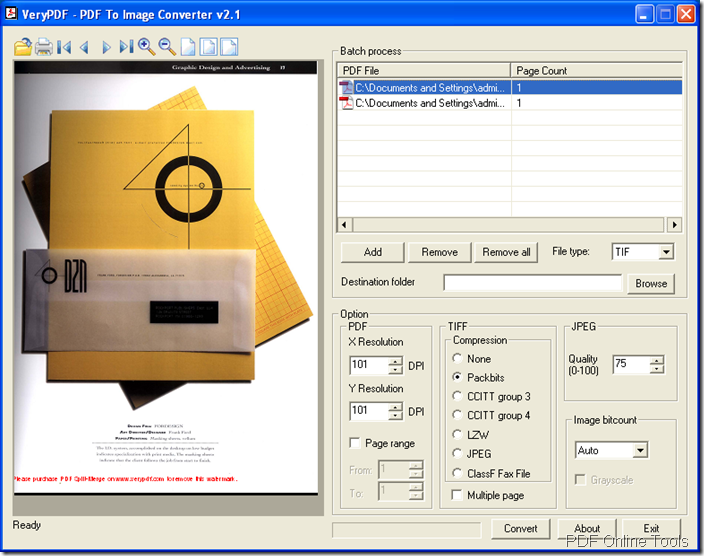 For learning more information about PDF to Image Converter, please enter its homepage.